Blankety train, godlessness rising, a big tax bill, ignosticism, the War of the Worlds and more! Carl Sagan’s Crazy Train - More vocab to expunge. God’s Lemmings Disapearing - Very, very slowly. The Hovinds owe three million smackers - Wish I had that kind of problem. Editor’s Choice: Ignosticism - What was the question again? 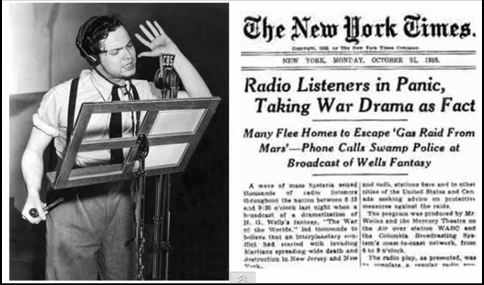 Orson Welles - War Of The Worlds - Radio Broadcast 1938 - Complete Broadcast — On October 30th, 1938, The Mercury Theatre on the Air, headed by a young Orson Welles, presented a conceptually innovative radio broadcast dramatization of H. G. Wells’ classic science fiction novel, The War of the Worlds. And all hell broke loose. Not that there is anything particularly controversial about the story. (And in a cultural and scientific context, as well as it being a darn good yarn, I consider the H. G. Wells novel a must read.) But the way it was presented by The Mercury Theater posed some problems for some of the more credulous listeners of the broadcast. 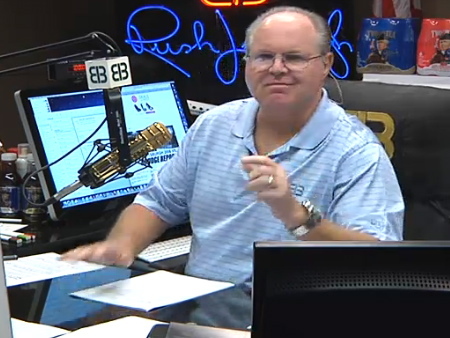 They believed that Martians were really invading our planet! As we near Halloween, I think this is a good time to look back on what went down on the night of the radio production of The War of the Worlds, because I think it serves as a good lesson in how some of us distinguish reality from fiction and truth from spin, when we believe it’s coming from a source that we trust. Sure, it was just a play. But for those who tuned in late, missing the introduction, and with it being presented in the form of news flashes interrupting regularly scheduled programming, to many people it was taken as the real thing. But not everyone who tuned in late took it that way. As he turned on his car radio, the 25-year-old law student heard some startling news. A huge meteorite had smashed into a New Jersey farm. “I knew it was a hoax,” said Brylawski, now 92. 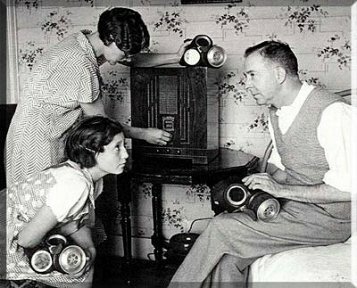 …However, the radio play, narrated by Orson Welles, had been written and performed to sound like a real news broadcast about an invasion from Mars. Thousands of people, believing they were under attack by Martians, flooded newspaper offices and radio and police stations with calls, asking how to flee their city or how they should protect themselves from “gas raids.” Scores of adults reportedly required medical treatment for shock and hysteria. I think hoax is too strong of a term to describe what Welles had done, but maybe it was a hoax. I tend to agree with Joe Nickell’s assessment of the broadcast. It wasn’t a hoax. It was a satire. Welles himself called it “an experiment” and at a later time he took some responsibility for what he called: “an assault on the credibility of that machine [radio] … and that [people] shouldn’t swallow everything that came through the tap, whether it was radio or not.” Welles was, along with all of his better known talents, a magician and a skeptic. Shortly after the broadcast, Orson Wells apologized for creating a public panic. And I suppose it was necessary, given that there really was a panic even if it has grown in size and severity in the minds of many over the years, to mythical proportions. Still, there is a lesson to be had here, and it’s as relevant today as it was when Welles was playing around with the new media: Don’t believe everything you read or hear! But of course, you already know that… Right? 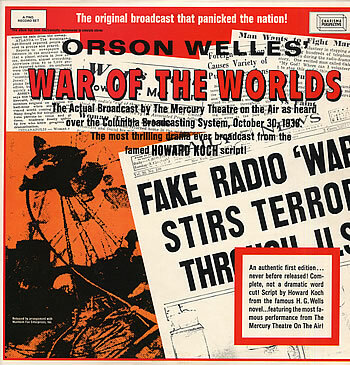 So just for the fun of it, fire up the fabulous Mercury Theater version of H. G. Wells’The War Of The Worlds - Radio Broadcast 1938 - Complete Broadcast! 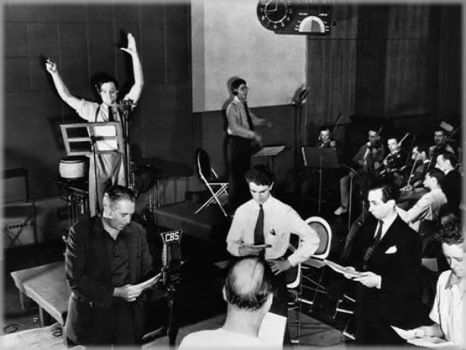 For more of the back story, see War of the Worlds Radio Broadcast Causes Panic. Wednesday, September 10th: The chat started with a no-show of our new chat host. We started out with The Stock Market Game, and the old wisdom that in games, the House is rigged to win. Then there was banking, and interest on credit cards, a few movies with a specific mention to debunking aliens (the debunking of History Channel’s Ancient Aliens). What can I say? History Channel is not in high standing! Sad news from sailingsoul about his beached boat. The last half hour was spent debating animals’ self-awareness and communication between other members of their species and us. Psychic Blues: Confessions of a Conflicted Medium, by Mark Edward with forward by James Randi. There were 8,909 daily visitors this week. There were 33,931 daily visitors in September, 2012.